File photo of the army bomb disposal team. A NUMBER OF houses in Galway were evacuated last night after a viable improvised explosive device (IED) was found. 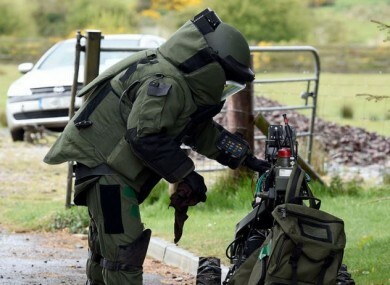 The Defence Forces deployed the explosive ordnance disposal (EOD) team on request from An Garda Síochána, after a suspect device was found by a resident close to the Ballybrit Industrial Estate late last night. A cordon was established and homes were evacuated. The EOD team arrived at the scene at 11.15pm and made the device safe, without the need for a controlled explosion, in the early hours of this morning. The device was then removed to a secure military location for further examination where it was later confirmed as viable. The scene was declared safe at 2.25am. Material of an evidential nature will be handed over to the gardaí to assist them with their investigation. Email “Houses evacuated after viable explosive is found in Galway”. Feedback on “Houses evacuated after viable explosive is found in Galway”.